The Book of Tobias, as it is called in the Latin Vulgate, is also known in the Greek Septuagint as the Book of Tobit, and serves as part of the Historical Books in the Latin Vulgate and Greek Septuagint Bible. Both the Hebrew origin of the book and the name Tobiah - טוֹבִיָּה which means "Yahweh is my good" have been appreciated since antiquity. The name itself is noted, for example, in 2 Chronicles 17:8, Ezra 2:60, Nehemiah 2:10, Tobit 1:9, and Zechariah 6:10. The recent discovery of five scrolls of Tobit - 4QTob 196-200 in both Aramaic and Hebrew among the Dead Sea Scrolls in Cave IV of Qumran has given the book renewed attention. As with all ancient texts discovered in the Dead Sea Scrolls, Hebrew was in consonantal form only. The Book of Tobit is also extant in Arabic, Armenian, Coptic, Ethiopic, and Syriac. This translation is primarily based upon the Codex Sinaiticus, the Greek version discovered in St. Catherine's Monastery at Mount Sinai, Egypt in 1844. The Book itself is one of the most delightful books of Hebrew Scripture. The book is a religious novel characterized as a Hebrew romance and is a captivating narrative. The father is called Tobit or Τωβίτ in the Greek Septuagint. The son is called Tobiah or טוביה in Aramaic (4Q196 2:3, 2:10, 2:12) and Hebrew (4Q200 4:3, 4:6), Tobias or Τωβίας in Greek, and Tobias in Latin. In this translation both father and son are known as Tobias. The book begins with Tobit or Tobias the Father, an Israelite of the Northern Kingdom deported to Nineveh who suffers blindness. Sara in Medes suffers torment. Because of their good life and prayers, God sends the Archangel Raphael to help them. 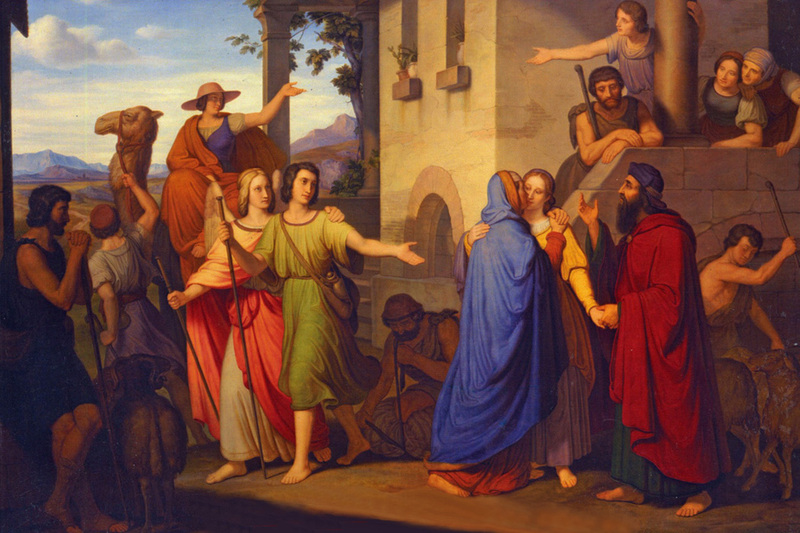 The virtuous Tobias the Son joins the disguised Raphael on a journey to Medes on his father's behalf, and brings happiness both to his Father and Sara. The message of the book is that God is both just and free. The book offers much wisdom and notes suffering is not a punishment but a test. God in the long run does reward the just and punish the wicked. The believer is called upon to trust God and live his way. The book presents the sanctity of Marriage, intercession through Angels, reward of good works, and parental respect, as well as the importance of prayer in our daily lives, fasting, and especially almsgiving in expiation of sin (12:9). Raphael reveals himself in a fascinating statement in Chapter 12 as "the angel Raphael, one of the seven who stand before the Lord" (12:15). Even though the setting takes place in the eighth century BC, it is thought the book was written after the time of Ezra, and thus it was not included in the shorter Hebrew Canon. However, the book followed Ezra and Nehemiah in the Greek Septuagint Old Testament and has always been considered inspired by both Catholic and Eastern Orthodox Churches. It is part of the Apocrypha in the King James Bible. The Historical Books are followed by the Wisdom Literature such as the Psalms in the Greek Septuagint, Latin Vulgate, and the Christian Old Testament of the Bible. The following Scripture is from the Douay-Rheims Bible, now in the public domain. The Douay-Rheims Bible was the standard English Bible for Catholics for over 300 years, and still remains in use today. The Douay-Rheims Bible was the first approved English translation of St. Jerome's Latin Vulgate Bible. The Old Testament translation was completed at the English College of Douai, France in 1609, and the New Testament at the English College of Rheims, France in 1582. The Douay-Rheims Bible was revised by Bishop Challoner in England from 1749 to 1752. The Haydock Douay-Rheims Bible of 1814 was the one upon which President John F. Kennedy took the oath of office on January 20, 1961 to become the 35th President of the United States. 1 Tobias of the tribe and city of Nephtali, (which is in the upper parts of Galilee above Naasson, beyond the way that leadeth to the west, having on the right hand the city of Sephet,) 2 When he was made captive in the days of Salmanasar king of the Assyrians, even in his captivity, forsook not the way of truth, 3 But every day gave all he could get to his brethren his fellow captives, that were of his kindred. 4 And when he was younger than any of the tribe of Nephtali, yet did he no childish thing in his work. 5 Moreover when all went to the golden calves which Jeroboam king of Israel had made, he alone fled the company of all, 6 And went to Jerusalem to the temple of the Lord, and there adored the Lord God of Israel, offering faithfully all his firstfruits, and his tithes, 7 So that in the third year he gave all his tithes to the proselytes, and strangers. 8 These and such like things did he observe when but a boy according to the law of God. 10 And from his infancy he taught him to fear God, and to abstain from all sin. 11 And when by the captivity he with his wife and his son and all his tribe was come to the city of Ninive, 12 (When all ate of the meats of the Gentiles) he kept his soul and never was defiled with their meats. 13 And because he was mindful of the Lord with all his heart, God gave him favour in the sight of Salmanasar the king. 14 And he gave him leave to go whithersoever he would, with liberty to do whatever he had a mind. 15 He therefore went to all that were in captivity, and gave them wholesome admonitions. 16 And when he was come to Rages a city of the Medes, and had ten talents of silver of that with which he had been honoured by the king: 17 And when amongst a great multitude of his kindred, he saw Gabelus in want, who was one of his tribe, taking a note of his hand he gave him the aforesaid sum of money. 18 But after a long time, Salmanasar the king being dead, when Sennacherib his son, who reigned in his place, had a hatred for the children of Israel: 19 Tobias daily went among all his kindred, and comforted them, and distributed to every one as he was able, out of his goods: 20 He fed the hungry, and gave clothes to the naked, and was careful to bury the dead, and they that were slain. 21 And when king Sennacherib was come back, fleeing from Judea by reason of the slaughter that God had made about him for his blasphemy, and being angry slew many of the children of Israel, Tobias buried their bodies. 22 But when it was told the king, he commanded him to be slain, and took away all his substance. 23 But Tobias fleeing naked away with his son and with his wife, lay concealed, for many loved him. 24 But after forty-five days, the king was killed by his own sons. 25 And Tobias returned to his house, and all his substance was restored to him. 1 But after this, when there was a festival of the Lord, and a good dinner was prepared in Tobias's house, 2 He said to his son: Go, and bring some of our tribe that fear God, to feast with us. 3 And when he had gone, returning he told him, that one of the children of Israel lay slain in the street. And he forthwith leaped up from his place at the table, and left his dinner, and came fasting to the body: 4 And taking it up carried it privately to his house, that after the sun was down, he might bury him cautiously. 5 And when he had hid the body, he ate bread with mourning and fear, 6 Remembering the word which the Lord spoke by Amos the prophet: Your festival days shall be turned into lamentation and mourning. 7 So when the sun was down, he went and buried him. 8 Now all his neighbours blamed him, saying: Once already commandment was given for thee to be slain because of this matter, and thou didst scarce escape the sentence of death, and dost thou again bury the dead? 9 But Tobias fearing God more than the king, carried off the bodies of them that were slain, and hid them in his house, and at midnight buried them. 10 Now it happened one day, that being wearied with burying, he came to his house, and cast himself down by the wall and slept, 11 And as he was sleeping, warm droppings out of a swallow's nest fell upon his eyes, and he was made blind. 12 Now this trial the Lord therefore permitted to happen to him, that an example might be given to posterity of his patience, as also of holy Job. 13 For whereas he had always feared God from his infancy, and kept his commandments, he repined not against God because the evil of blindness had befallen him, 14 But continued immoveable in the fear of God, giving thanks to God all the days of his life. 15 For as the kings insulted over holy Job: so his relations and kinsmen mocked at his life, saying: 16 Where is thy hope, for which thou gavest alms, and buriedst the dead? 17 But Tobias rebuked them, saying: Speak not so: 18 For we are the children of the saints, and look for that life which God will give to those that never change their faith from him. 19 Now Anna his wife went daily to weaving work, and she brought home what she could get for their living by the labour of her hands. 20 Whereby it came to pass, that she received a young kid, and brought it home: 21 And when her husband heard it bleating, he said: Take heed, lest perhaps it be stolen: restore ye it to its owners, for it is not lawful for us either to eat or to touch any thing that cometh by theft. 22 At these words his wife being angry answered: It is evident thy hope is come to nothing, and thy alms now appear. 23 And with these, and other such like words she upbraided him. 1 Then Tobias sighed, and began to pray with tears, 2 Saying: Thou art just, O Lord, and all thy judgments are just, and all thy ways mercy, and truth, and judgment: 3 And now, O Lord, think of me, and take not revenge of my sins, neither remember my offenses, nor those of my parents. 4 For we have not obeyed thy commandments, therefore are we delivered to spoil and to captivity, and death, and are made a fable, and a reproach to all nations, amongst which thou hast scattered us. 5 And now, O Lord, great are thy judgments, because we have not done according to thy precepts, and have not walked sincerely before thee: 6 And now, O Lord, do with me according to thy will, and command my spirit to be received in peace: for it is better for me to die, than to live. 7 Now it happened on the same day, that Sara daughter of Raguel, in Rages a city of the Medes, received a reproach from one of her father's servant maids, 8 Because she had been given to seven husbands, and a devil named Asmodeus had killed them, at their first going in unto her. 9 So when she reproved the maid for her fault, she answered her, saying: May we never see son, or daughter of thee upon the earth, thou murderer of thy husbands. 10 Wilt thou kill me also, as thou hast already killed seven husbands? At these words she went into an upper chamber of her house: and for three days and three nights did neither eat nor drink: 11 But continuing in prayer with tears besought God, that he would deliver her from this reproach. 12 And it came to pass on the third day, when she was making an end of her prayer, blessing the Lord, 13 She said: Blessed is thy name, O God of our fathers: who when thou hast been angry, wilt shew mercy, and in the time of tribulation forgivest the sins of them that call upon thee. 14 To thee, O Lord, I turn my face, to thee I direct my eyes. 15 I beg, O Lord, that thou loose me from the bond of this reproach, or else take me away from the earth. 16 Thou knowest, O Lord, that I never coveted a husband, and have kept my soul clean from all lust. 17 Never have I joined myself with them that play: neither have I made myself partaker with them that walk in lightness. 18 But a husband I consented to take, with thy fear, not with my lust. 19 And either I was unworthy of them, or they perhaps were not worthy of me: because perhaps thou hast kept me for another man. 20 For thy counsel is not in man's power. 21 But this every one is sure of that worshippeth thee, that his life, if it be under trial, shall be crowned: and if it be under tribulation, it shall be delivered: and if it be under correction, it shall be allowed to come to thy mercy. 22 For thou art not delighted in our being lost: because after a storm thou makest a calm, and after tears and weeping thou pourest in joyfulness. 23 Be thy name, O God of Israel, blessed for ever. 25 And the holy angel of the Lord, Raphael was sent to heal them both, whose prayers at one time were rehearsed in the sight of the Lord. 2 And said to him: Hear, my son, the words of my mouth, and lay them as a foundation in thy heart. 4 For thou must be mindful what and how great perils she suffered for thee in her womb. 5 And when she also shall have ended the time of her life, bury her by me. 6 And all the days of thy life have God in thy mind: and take heed thou never consent to sin, nor transgress the commandments of the Lord our God. for so it shall come to pass that the face of the Lord shall not be turned from thee. 8 According to thy ability be merciful. 9 If thou have much give abundantly: if thou have a little, take care even so to bestow willingly a little. 10 For thus thou storest up to thyself a good reward for the day of necessity. 11 For alms deliver from all sin, and from death, and will not suffer the soul to go into darkness. 12 Alms shall be a great confidence before the most high God, to all them that give it. 13 Take heed to keep thyself, my son, from all fornication, and beside thy wife never endure to know a crime. 14 Never suffer pride to reign in thy mind, or in thy words: for from it all perdition took its beginning. 15 If any man hath done any work for thee, immediately pay him his hire, and let not the wages of thy hired servant stay with thee at all. 16 See thou never do to another what thou wouldst hate to have done to thee by another. 17 Eat thy bread with the hungry and the needy, and with thy garments cover the naked. 18 Lay out thy bread, and thy wine upon the burial of a just man, and do not eat and drink thereof with the wicked. 19 Seek counsel always of a wise man. 20 Bless God at all times: and desire of him to direct thy ways, and that all thy counsels may abide in him. 21 I tell thee also, my son, that I lent ten talents of silver, while thou wast yet a child, to Gabelus, in Rages a city of the Medes, and I have a note of his hand with me: 22 Now therefore inquire how thou mayst go to him, and receive of him the foresaid sum of money, and restore to him the note of his hand. 23 Fear not, my son: we lead indeed a poor life, but we shall have many good things if we fear God, and depart from all sin, and do that which is good. 1 Then Tobias answered his father, and said: I will do all things, father, which thou hast commanded me. 2 But how I shall get this money, I cannot tell; he knoweth me not, and I know not him: what token shall I give him? nor did I ever know the way which leadeth thither. 3 Then his father answered him, and said: I have a note of his hand with me, which when thou shalt shew him, he will presently pay it. 4 But go now, and seek thee out some faithful man, to go with thee for his hire: that thou mayst receive it, while I yet live. 5 Then Tobias going forth, found a beautiful young man, standing girded, and as it were ready to walk. 6 And not knowing that he was an angel of God, he saluted him, and said: From whence art thou, good young man? 7 But he answered: Of the children of Israel. And Tobias said to him: Knowest thou the way that leadeth to the country of the Medes? 8 And he answered: I know it: and I have often walked through all the ways thereof, and I have abode with Gabelus our brother, who dwelleth at Rages a city of the Medes, which is situate in the mount of Ecbatana. 9 And Tobias said to him: Stay for me, I beseech thee, till I tell these same things to my father. 10 Then Tobias going in told all these things to his father. Upon which his father being in admiration, desired that he would come in unto him. 11 So going in he saluted him, and said: Joy be to thee always. 12 And Tobias said: What manner of joy shall be to me, who sit in darkness, and see not the light of heaven? 13 And the young man said to him: Be of good courage, thy cure from God is at hand. 14 And Tobias said to him: Canst thou conduct my son to Gabelus at Rages, a city of the Medes? and when thou shalt return, I will pay thee thy hire. 15 And the angel said to him: I will conduct him thither, and bring him back to thee. 16 And Tobias said to him: I pray thee, tell me, of what family, or what tribe art thou? 17 And Raphael the angel answered: Dost thou seek the family of him thou hirest, or the hired servant himself to go with thy son? 18 But lest I should make thee uneasy, I am Azarias the son of the great Ananias. 19 And Tobias answered: Thou art of a great family. But I pray thee be not angry that I desired to know thy family. 20 And the angel said to him: I will lead thy son safe, and bring him to thee again safe. 21 And Tobias answering, said: May you have a good journey, and God be with you in your way, and his angel accompany you. 22 Then all things being ready, that were to be carried in their journey, Tobias bade his father and his mother farewell, and they set out both together. 23 And when they were departed, his mother began to weep, and to say: Thou hast taken the staff of our old age, and sent him away from us. 24 I wish the money for which thou hast sent him, had never been. 25 For poverty was sufficient for us, that we might account it as riches, that we saw our son. 26 And Tobias said to her: Weep not, our son will arrive thither safe, and will return safe to us, and thy eyes shall see him. 27 For I believe that the good angel of God doth accompany him, and doth order all things well that are done about him, so that he shall return to us with joy. 28 At these words his mother ceased weeping, and held her peace. 1 And Tobias went forward, and the dog followed him, and he lodged the first night by the river of Tigris. 2 And he went out to wash his feet, and behold a monstrous fish came up to devour him. 3 And Tobias being afraid of him, cried out with a loud voice, saying: Sir, he cometh upon me. 4 And the angel said to him: Take him by the gill, and draw him to thee. And when he had done so, he drew him out upon the land, and he began to pant before his feet. 5 Then the angel said to him: Take out the entrails of the fish, and lay up his heart, and his gall, and his liver for thee: for these are necessary for useful medicines. 6 And when he had done so, he roasted the flesh thereof, and they took it with them in the way: the rest they salted as much as might serve them, till they came to Rages the city of the Medes. 7 Then Tobias asked the angel, and said to him: I beseech thee, brother Azarias, tell me what remedies are these things good for, which thou hast bid me keep of the fish? 8 And the angel, answering, said to him: If thou put a little piece of its heart upon coals, the smoke thereof driveth away all kind of devils, either from man or from woman, so that they come no more to them. 9 And the gall is good for anointing the eyes, in which there is a white speck, and they shall be cured. 10 And Tobias said to him: Where wilt thou that we lodge? 11 And the angel answering, said: Here is one whose name is Raguel, a near kinsman of thy tribe, and he hath a daughter named Sara, but he hath no son nor any other daughter beside her. 12 All his substance is due to thee, and thou must take her to wife. 13 Ask her therefore of her father, and he will give her thee to wife. 14 Then Tobias answered, and said: I hear that she hath been given to seven husbands, and they all died: moreover I have heard, that a devil killed them. 15 Now I am afraid, lest the same thing should happen to me also: and whereas I am the only child of my parents, I should bring down their old age with sorrow to hell. 16 Then the angel Raphael said to him: Hear me, and I will shew thee who they are, over whom the devil can prevail. 17 For they who in such manner receive matrimony, as to shut out God from themselves, and from their mind, and to give themselves to their lust, as the horse and mule, which have not understanding, over them the devil hath power. 18 But thou when thou shalt take her, go into the chamber, and for three days keep thyself continent from her, and give thyself to nothing else but to prayers with her. 19 And on that night lay the liver of the fish on the fire, and the devil shall be driven away. 20 But the second night thou shalt be admitted into the society of the holy Patriarchs. 21 And the third night thou shalt obtain a blessing that sound children may be born of you. 22 And when the third night is past, thou shalt take the virgin with the fear of the Lord, moved rather for love of children than for lust, that in the seed of Abraham thou mayst obtain a blessing in children. 1 And they went in to Raguel, and Raguel received them with joy. 2 And Raguel looking upon Tobias, said to Anna his wife: How like is this young man to my cousin? 3 And when he had spoken these words, he said: Whence are ye young men our brethren? 4 But they said: We are of the tribe of Nephtali, of the captiveof Ninive. 5 And Raguel said to them: Do you know Tobias my brother? And they said: We know him. 6 And when he was speaking many good things of him, the angel said to Raguel: Tobias concerning whom thou inquirest is this young man's father. 7 And Raguel went to him, and kissed him with tears, and weeping upon his neck, said: A blessing be upon thee, my son, because thou art the son of a good and most virtuous man. 8 And Anna his wife, and Sara their daughter wept. 9 And after they had spoken, Raguel commanded a sheep to be killed, and a feast to be prepared. And when he desired them to sit down to dinner, 10 Tobias said: I will not eat nor drink here this day, unless thou first grant me my petition, and promise to give me Sara thy daughter. 11 Now when Raguel heard this he was afraid, knowing what had happened to those seven husbands, that went in unto her: and he began to fear lest it might happen to him also in like manner: and as he was in suspense, and gave no answer to his petition, 12 The angel said to him: Be not afraid to give her to this man, for to him who feareth God is thy daughter due to be his wife: therefore another could not have her. 13 Then Raguel said: I doubt not but God hath regarded my prayers and tears in his sight. 14 And I believe he hath therefore made you come to me, that this maid might be married to one of her own kindred, according to the law of Moses: and now doubt not but I will give her to thee. 15 And taking the right hand of his daughter, he gave it into the right hand of Tobias, saying: The God of Abraham, and the God of Isaac, and the God of Jacob be with you, and may he join you together, and fulfill his blessing in you. 16 And taking paper they made a writing of the marriage. 17 And afterwards they made merry, blessing God. 18 And Raguel called to him Anna his wife, and bade her prepare another chamber. 19 And she brought Sara her daughter in thither, and she wept. 20 And she said to her: Be of good cheer, my daughter: the Lord of heaven give thee joy for the trouble thou hast undergone. 1 And after they had supped, they brought in the young man to her. 2 And Tobias remembering the angel's word, took out of his bag part of the liver, and laid it upon burning coals. 3 Then the angel Raphael took the devil, and bound him in the desert of upper Egypt. 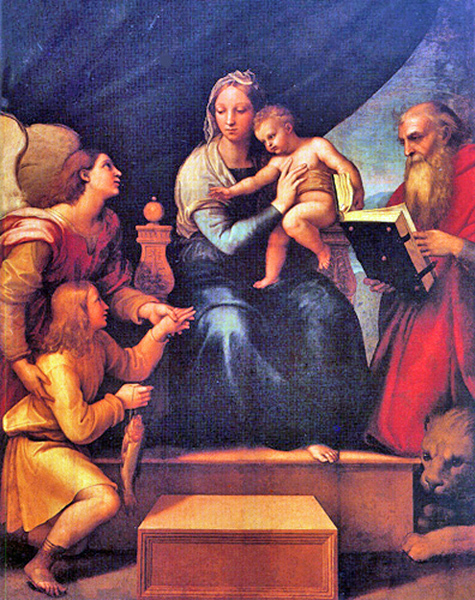 4 Then Tobias exhorted the virgin, and said to her: Sara, arise, and let us pray to God today, and tomorrow, and the next day: because for these three nights we are joined to God: and when the third night is over, we will be in our own wedlock. 5 For we are the children of saints, and we must not be joined together like heathens that know not God. 6 So they both arose, and prayed earnestly both together that health might be given them, 7 And Tobias said: Lord God of our father, may the heavens and the earth, and the sea, and the fountains, and the rivers, and all thy creatures that are in them, bless thee. 8 Thou madest Adam of the slime of the earth, and gavest him Eve for a helper. 9 And now, Lord, thou knowest, that not for fleshly lust do I take my sister to wife, but only for the love of posterity, in which thy name may be blessed for ever and ever. 10 Sara also said: Have mercy on us, O Lord, have mercy on us, and let us grow old both together in health. 11 And it came to pass about the cockcrowing, Raguel ordered his servants to be called for, and they went with him together to dig a grave. 12 For he said: Lest perhaps it may have happened to him, in like manner as it did to the other seven husbands, that went in unto her. 13 And when they had prepared the pit, Raguel went back to his wife, and said to her: 14 Send one of thy maids, and let her see if he be dead, that I may bury him before it be day. 15 So she sent one of her maidservants, who went into the chamber, and found them safe and sound, sleeping both together. 16 And returning she brought the good news: and Raguel and Anna his wife blessed the Lord, 17 And said: We bless thee, O Lord God of Israel, because it hath not happened as we suspected. 18 For thou hast shewn thy mercy to us, and hast shut out from us the enemy that persecuted us. 19 And thou hast taken pity upon two only children. Make them, O Lord, bless thee more fully: and to offer up to thee a sacrifice of thy praise, and of their health, that all nations may know, that thou alone art God in all the earth. 20 And immediately Raguel commanded his servants, to fill up the pit they had made, before it was day. 21 And he spoke to his wife to make ready a feast, and prepare all kind of provisions that are necessary for such as go a journey. 22 He caused also two fat kine, and four wethers to be killed, and a banquet to be prepared for all his neighbours, and all his friends. 23 And Raguel adjured Tobias, to abide with him two weeks. 24 And of all things which Raguel possessed, he gave one half to Tobias, and made him a writing, that the half that remained should after their decease come also to Tobias. 1 Then Tobias called the angel to him, whom he took to be a man, and said to him: Brother Azarias, I pray thee hearken to my words: 2 If I should give myself to be thy servant I should not make a worthy return for thy care. 3 However, I beseech thee, to take with thee beasts and servants, and to go to Gabelus to Rages the city of the Medes: and to restore to him his note of hand, and receive of him the money, and desire him to come to my wedding. 4 For thou knowest that my father numbereth the days: and if I stay one day more, his soul will be afflicted. 5 And indeed thou seest how Raguel hath adjured me, whose adjuring I cannot despise. 6 Then Raphael took four of Raguel's servants, and two camels, and went to Rages the city of the Medes: and finding Gabelus, gave him his note of hand, and received of him all the money. 7 And he told him concerning Tobias the son of Tobias, all that had been done: and made him come with him to the wedding. 8 And when he was come into Raguel's house he found Tobias sitting at the table: and he leaped up, and they kissed each other: and Gabelus wept, and blessed God, 9 And said: The God of Israel bless thee, because thou art the son of a very good and just man, and that feareth God, and doth almsdeeds: 10 And may a blessing come upon thy wife and upon your parents. 11 And may you see your children, and your children's children, unto the third and fourth generation: and may your seed be blessed by the God of Israel, who reigneth for ever and ever. 12 And when all had said, Amen, they went to the feast: but the marriage feast they celebrated also with the fear of the Lord. 1 But as Tobias made longer stay upon occasion of the marriage, Tobias his father was solicitous, saying: Why thinkest thou doth my son tarry, or why is he detained there? 2 Is Gabelus dead, thinkest thou, and no man will pay him the money? 3 And he began to be exceeding sad, both he and Anna his wife with him: and they began both to weep together: because their son did not return to them on the day appointed. 4 But his mother wept and was quite disconsolate, and said: Woe, woe is me, my son; why did we send thee to go to a strange country, the light of our eyes, the staff of our old age, the comfort of our life, the hope of our posterity? 5 We having all things together in thee alone, ought not to have let thee go from us. 6 And Tobias said to her: Hold thy peace, and be not troubled, our son is safe: that man with whom we sent him is very trusty. 7 But she could by no means be comforted, but daily running out looked round about, and went into all the ways by which there seemed any hope he might return, that she might if possible see him coming afar off. 8 But Raguel said to his son in law: Stay here, and I will send a messenger to Tobias thy father, that thou art in health. 9 And Tobias said to him: I know that my father and mother now count the days, and their spirit is grievously afflicted within them. 10 And when Raguel had pressed Tobias with many words, and he by no means would hearken to him, he delivered Sara unto him, and half of all his substance in menservants, and womenservants, in cattle, in camels, and in kine, and in much money, and sent him away safe and joyful from him. 11 Saying: The holy angel of the Lord be with you in your journey, and bring you through safe, and that you may find all things well about your parents, and my eyes see your children before I die. 12 And the parents taking their daughter kissed her, and let her go: 13 Admonishing her to honour her father and mother in law, to love her husband, to take care of the family, to govern the house, and to behave herself irreprehensibly. 1 And as they were returning they came to Charan, which is in the midway to Ninive, the eleventh day. 2 And the angel said: Brother Tobias, thou knowest how thou didst leave thy father. 3 If it please thee therefore, let us go before, and let the family follow softly after us, together with thy wife, and with the beasts. 4 And as this their going pleased him, Raphael said to Tobias: Take with thee of the gall of the fish, for it will be necessary. So Tobias took some of that gall and departed. 5 But Anna sat beside the way daily, on the top of a hill, from whence she might see afar off. 6 And while she watched his coming from that place, she saw him afar off, and presently perceived it was her son coming: and returning she told her husband, saying: Behold thy son cometh. 7 And Raphael said to Tobias: As soon as thou shalt come into thy house, forthwith adore the Lord thy God: and giving thanks to him, go to thy father, and kiss him. 8 And immediately anoint his eyes with this gall of the fish, which thou carriest with thee. For be assured that his eyes shall be presently opened, and thy father shall see the light of heaven, and shall rejoice in the sight of thee. 9 Then the dog, which had been with them in the way, ran before, and coming as if he had brought the news, shewed his joy by his fawning and wagging his tail. 10 And his father that was blind, rising up, began to run stumbling with his feet: and giving a servant his hand, went to meet his son. 11 And receiving him kissed him, as did also his wife, and they began to weep for joy. 12 And when they had adored God, and given him thanks, they sat down together. 13 Then Tobias taking of the gall of the fish, anointed his father's eyes. 14 And he stayed about half an hour: and a white skin began to come out of his eyes, like the skin of an egg. 15 And Tobias took hold of it, and drew it from his eyes, and immediately he recovered his sight. 16 And they glorified God, both he and his wife and all that knew them. 17 And Tobias said: I bless thee, O Lord God of Israel, because thou hast chastised me, and thou hast saved me: and behold I see Tobias my son. 18 And after seven days Sara his son's wife, and all the family arrived safe, and the cattle, and the camels, and an abundance of money of his wife's: and that money also which he had received of Gabelus: 19 And he told his parents all the benefits of God, which he had done to him by the man that conducted him. 20 And Achior and Nabath the kinsmen of Tobias came, rejoicing for Tobias, and congratulating with him for all the good things that God had done for him. 21 And for seven days they feasted and rejoiced all with great joy. 1 Then Tobias called to him his son, and said to him: What can we give to this holy man, that is come with thee? 2 Tobias answering, said to his father: Father, what wages shall we give him? or what can be worthy of his benefits? 3 He conducted me and brought me safe again, he received the money of Gabelus, he caused me to have my wife, and he chased from her the evil spirit, he gave joy to her parents, myself he delivered from being devoured by the fish, thee also he hath made to see the light of heaven, and we are filled with all good things through him. What can we give him sufficient for these things? 4 But I beseech thee, my father, to desire him, that he would vouchsafe to accept one half of all things that have been brought. 5 So the father and the son, calling him, took him aside: and began to desire him that he would vouchsafe to accept of half of all things that they had brought. 6 Then he said to them secretly: Bless ye the God of heaven, give glory to him in the sight of all that live, because he hath shewn his mercy to you. 7 For it is good to hide the secret of a king: but honourable to reveal and confess the works of God. 9 For alms delivereth from death, and the same is that which purgeth away sins, and maketh to find mercy and life everlasting. 10 But they that commit sin and iniquity, are enemies to their own soul. 11 I discover then the truth unto you, and I will not hide the secret from you. 12 When thou didst pray with tears, and didst bury the dead, and didst leave thy dinner, and hide the dead by day in thy house, and bury them by night, I offered thy prayer to the Lord. 13 And because thou wast acceptable to God, it was necessary that temptation should prove thee. 14 And now the Lord hath sent me to heal thee, and to deliver Sara thy son's wife from the devil. 15 For I am the angel Raphael, one of the seven who stand before the Lord. 16 And when they had heard these things, they were troubled, and being seized with fear they fell upon the ground on their face. 17 And the angel said to them: Peace be to you, fear not. 18 For when I was with you, I was there by the will of God: bless ye him, and sing praises to him. 19 I seemed indeed to eat and to drink with you: but I use an invisible meat and drink, which cannot be seen by men. 20 It is time therefore that I return to him that sent me: but bless ye God, and publish all his wonderful works. 21 And when he had said these things, he was taken from their sight, and they could see him no more. 22 Then they lying prostrate for three hours upon their face, blessed God: and rising up, they told all his wonderful works. 1 And Tobias the elder opening his mouth, blessed the Lord, and said: Thou art great, O Lord, for ever, and thy kingdom is unto all ages: 2 For thou scourgest, and thou savest: thou leadest down to hell, and bringest up again: and there is none that can escape thy hand. 3 Give glory to the Lord, ye children of Israel, and praise him in the sight of the Gentiles: 4 Because he hath therefore scattered you among the Gentiles, who know not him, that you may declare his wonderful works, and make them know that there is no other almighty God besides him. 5 He hath chastised us for our iniquities: and he will save us for his own mercy. 6 See then what he hath done with us, and with fear and trembling give ye glory to him: and extol the eternal King of worlds in your works. 7 As for me, I will praise him in the land of my captivity: because he hath shewn his majesty toward a sinful nation. 8 Be converted therefore, ye sinners, and do justice before God, believing that he will shew his mercy to you. 9 And I and my soul will rejoice in him. 10 Bless ye the Lord, all his elect, keep days of joy, and give glory to him. 11 Jerusalem, city of God, the Lord hath chastised thee for the works of thy hands. 12 Give glory to the Lord for thy good things, and bless the God eternal, that he may rebuild his tabernacle in thee, and may call back all the captives to thee, and thou mayst rejoice for ever and ever. 13 Thou shalt shine with a glorious light: and all the ends of the earth shall worship thee. 14 Nations from afar shall come to thee: and shall bring gifts, and shall adore the Lord in thee, and shall esteem thy land as holy. 15 For they shall call upon the great name in thee. 16 They shall be cursed that shall despise thee: and they shall be condemned that shall blaspheme thee: and blessed shall they be that shall build thee up. 17 But thou shalt rejoice in thy children, because they shall all be blessed, and shall be gathered together to the Lord. 18 Blessed are all they that love thee, and that rejoice in thy peace. 19 My soul, bless thou the Lord, because the Lord our God hath delivered Jerusalem his city from all her troubles. 20 Happy shall I be if there shall remain of my seed, to see the glory of Jerusalem. 21 The gates of Jerusalem shall be built of sapphire, and of emerald, and all the walls thereof round about of precious stones. 22 All its streets shall be paved with white and clean stones: and Alleluia shall be sung in its streets. 23 Blessed be the Lord, who hath exalted it, and may he reign over it for ever and ever, Amen. 6 The destruction of Ninive is at hand: for the word of the Lord must be fulfilled: and our brethren, that are scattered abroad from the land of Israel, shall return to it. 7 And all the land thereof that is desert shall be filled with people, and the house of God which is burnt in it, shall again be rebuilt: and all that fear God shall return thither. 8 And the Gentiles shall leave their idols, and shall come into Jerusalem, and shall dwell in it. 9 And all the kings of the earth shall rejoice in it, adoring the King of Israel. 10 Hearken therefore, my children, to your father: serve the Lord in truth, and seek to do the things that please him: 11 And command your children that they do justice and almsdeeds, and that they be mindful of God, and bless him at all times in truth, and with all their power. 12 And now, children, hear me, and do not stay here: but as soon as you shall bury your mother by me in one sepulchre, without delay direct your steps to depart hence: 13 For I see that its iniquity will bring it to destruction. 14 And it came to pass that after the death of his mother, Tobias departed out of Ninive with his wife, and children, and children's children, and returned to his father and mother in law. 15 And he found them in health in a good old age: and he took care of them, and he closed their eyes: and all the inheritance of Raguel's house came to him: and he saw his children's children to the fifth generation. 16 And after he had lived ninety-nine years in the fear of the Lord, with joy they buried him. 17 And all his kindred, and all his generation continued in good life, and in holy conversation, so that they were acceptable both to God, and to men, and to all that dwelt in the land.